As a boy in the 1970s, CanCooker inventor Seth McGinn helped brand and vaccinate cattle on his grandparent’s Nebraska ranch. A roundup is hard work; you start at dawn, and by lunchtime, you’ve built up quite an appetite. In eastern Nebraska, area ranchers would gather together to pitch in with each rancher’s roundups to vaccinate and brand cows and calves. At the start of the day, each family would drop portions of vegetables and meat into an old steel cream can that was placed on a fire to cook while they worked. At lunchtime, stomachs were grumbling. The ranchers and their children would come back to a hot, hearty, homemade meal—cooked to perfection—that easily fed the entire group. Decades later, McGinn tried to reproduce this cooking method for a family gathering, but the cream can that he used fell apart in the fire, ruining 50 pounds of food. McGinn realized that modern cream cans are primarily decorative, as compared to the durable cans of the ’60s and ’70s. After trying numerous alternatives, McGinn decided to create an improved design that was safe, durable, easy to use and easy to clean. The result was the CanCooker. The CanCooker will cook just about any meal you can think of from cakes to ribs to omelets. The US Midwest is a region that saw a great influx of immigration from Germany, Italy Hungary, and Scandinavia during the 1700’s. With them came beer, sausages, potatoes, pasta, sauerkraut and goulash. This combination of foods and cooking styles quickly led the way to Milk Can Suppers. 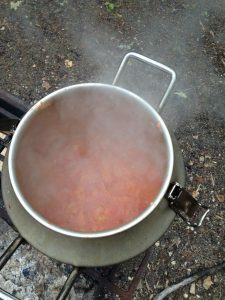 Cooking in a milk can is perfect for use in outdoor kitchens and for feeding large groups of people. They can be used like a slow cooker or a steamer. 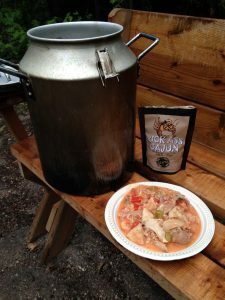 I have tried Italian dishes and Cajun Jambalaya but the following recipe is a bit more traditional with respect to its roots and can be prepared using all local ingredients. 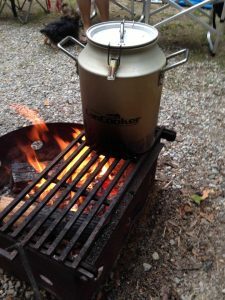 Before you go digging an old milk can out of your garage there are a few things to consider about your milk can cooker. Often antique milk cans were not made from galvanized metals which means that they will have an adverse effect on your food and your health if you use one of these. CanCooker is the modern version of milk can cooking and are available for through their Facebook page. They come in a variety of sizes, are made with stainless steel and are easy to use. Place all ingredients in the milk can in the order as they are listed starting from the top, so pour in the beer, place corn in beer, topped with the potatoes and so on down the list, with the sausages on top with the lid. Prepare a hot fire between two cinder blocks or something similar that will hold can above and close to the fire. If the wind is blowing, prepare something to protect the fire. Set the can on the blocks and tend the fire for approximately 1 1/2 hours. Have two people armed in insulated gloves remove the can from the fire and set it on the ground for 20 minutes to cool. Carefully remove the lid while being mindful that the escaping steam can cause serious burns. Either serve supper strait from the can with ladles or pour out the contents into large serving bowls. Remove the can from the fire and carefully remove the lid. Two individuals, wearing insulated gloves, should then pour the can’s contents into waiting large bowls. Add serving spoons and have guests serve themselves. Posted on Saturday, February 11th, 2017 at 8:27 am	and is filed under Recipes.